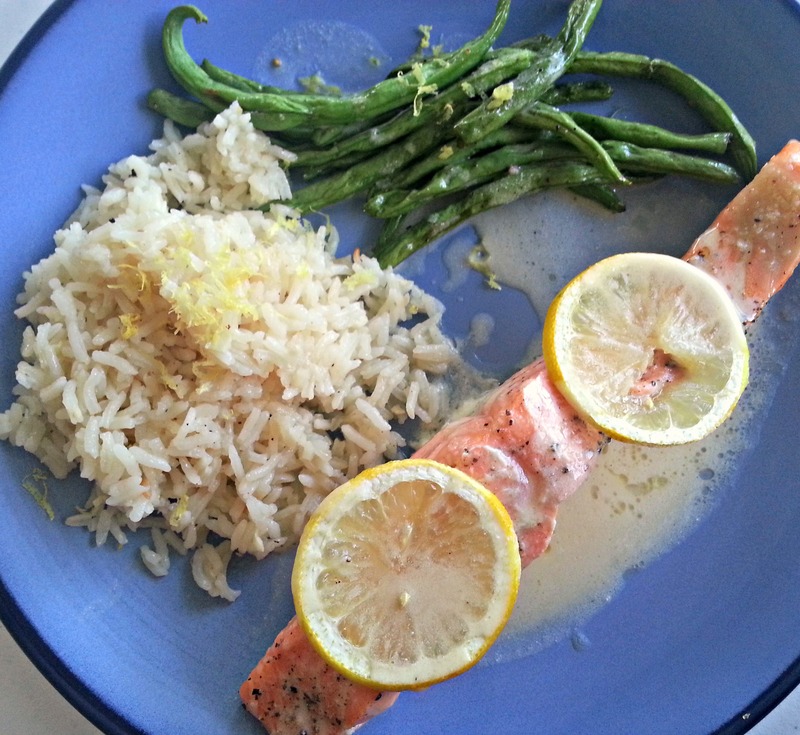 Quick Post: I served this with my favorite roasted green beans and this garlic rice pilaf – oh, and don’t forget to splurge a little and cover the whole plate with lemon butter sauce. 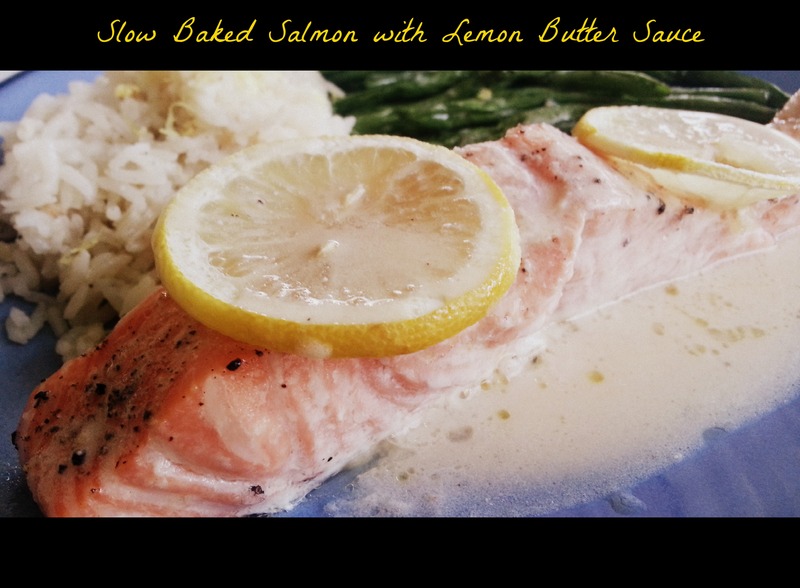 I have baked salmon several times before, but I was curious about this “slow” baking method. It is easy to overcook fish, and there isn’t much you can do to redeem it; so using a lower temp and a little longer cook time is a safe bet. 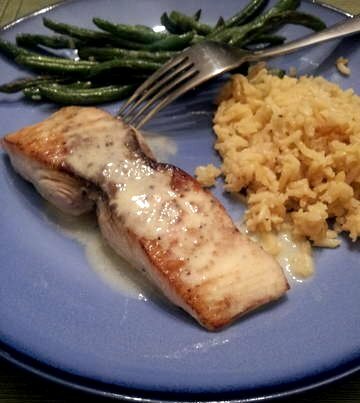 The salmon came out perfectly moist and flavorful – almost custard like in the center; and the addition of the tangy, rich lemon butter sauce made for a crave-worthy fish dinner. Thanks for reading, enjoy! Preheat oven to 275°F. Line a rimmed baking sheet with aluminum foil. Brush with 1/2 tablespoon oil. Place salmon fillets, skin side down, on prepared baking sheet. Season with salt and pepper, and lay lemon slices over top the fish. Bake salmon until just opaque in center, 12-15 minutes. Heat a large nonreactive skillet over high heat. When the skillet is hot, add the wine, lemons, garlic, and shallots. Cook for 3 minutes, breaking up and mashing the lemons with a wire whisk. Stir in the salt, pepper, Worcestershire, and hot sauce and cook until the mixture is somewhat syrupy, for about 3 minutes. Stir in the cream and cook for 1 minute. Over low heat, whisk in the butter a few pats at a time. When all of the butter has been added, remove from the heat, but continue whisking until all of the butter is incorporated into the sauce. Strain the sauce, pressing all of the liquid into a bowl. Stir in the parsley. Serve immediately, or keep warm for a few minutes until ready to use. 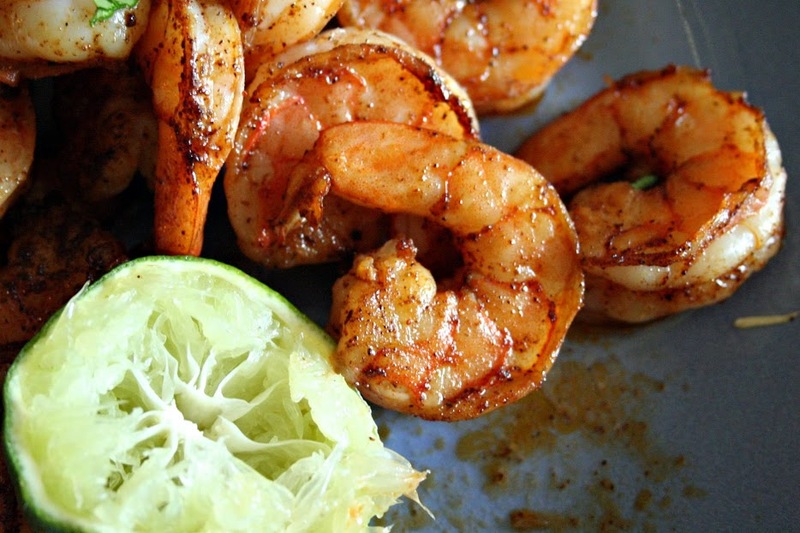 In a small bowl, combine the lime juice, olive oil, chipotle powder, cumin, paprika and salt, and stir until smooth. Pat the fish dry with paper towels. 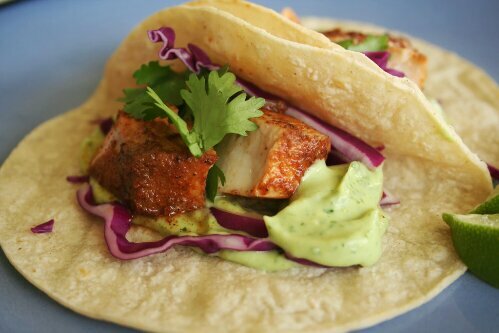 Rub on both sides with the lime-chipotle marinade. Transfer to a plate and cover tightly with plastic wrap, then transfer to the refrigerator to marinate for 15-20 minutes. 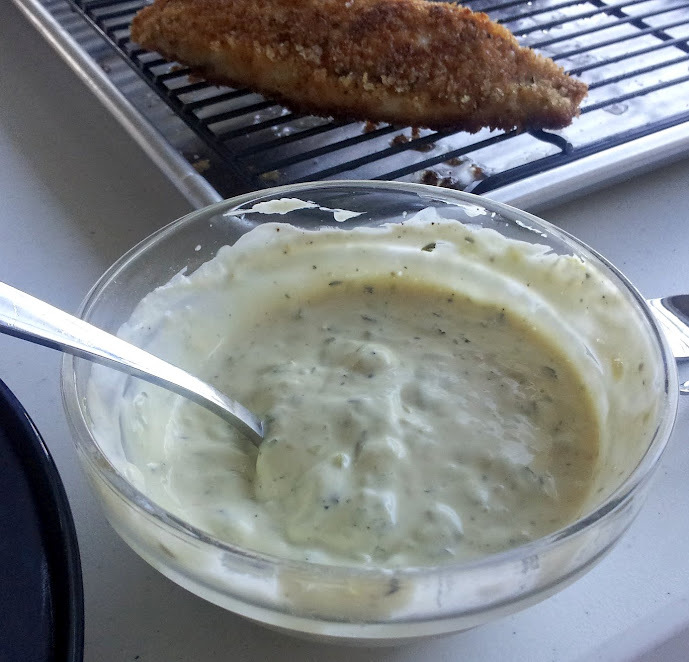 While the fish marinates, prepare the avocado-yogurt sauce. In the bowl of a food processor, combine the avocado, yogurt, lime juice, cilantro, salt and water, and process until smooth and creamy. Transfer to a serving bowl and cover tightly with plastic wrap. Refrigerate until ready to use. In a large heavy-bottomed skillet set over medium-high heat, saute the fish in the remaining 2 tbsp olive oil until opaque and flaky, about 4-5 minutes per side. 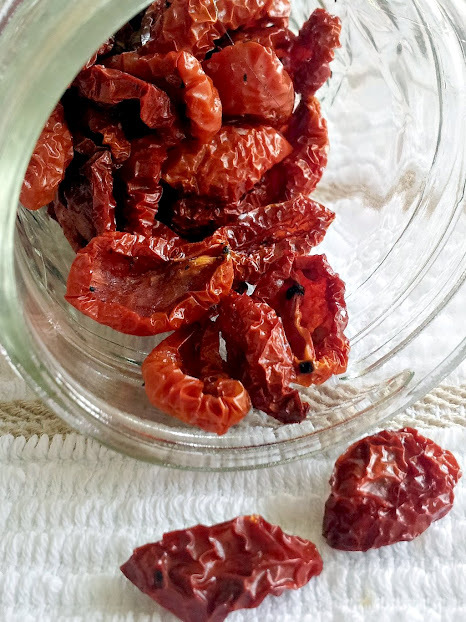 Remove from heat, and transfer to a platter. Using a fork, break up each filet into bite-sized chunks. Cover with foil, and set aside while you warm the tortillas. In a heavy-bottomed skillet set over medium heat, warm the tortillas one at a time for 20-30 seconds per side, or until soft and flexible. Wrap the finished tortillas with a clean dishcloth to keep warm between batches. To assemble, place three tortillas on each plate and drizzle with avocado-yogurt sauce. 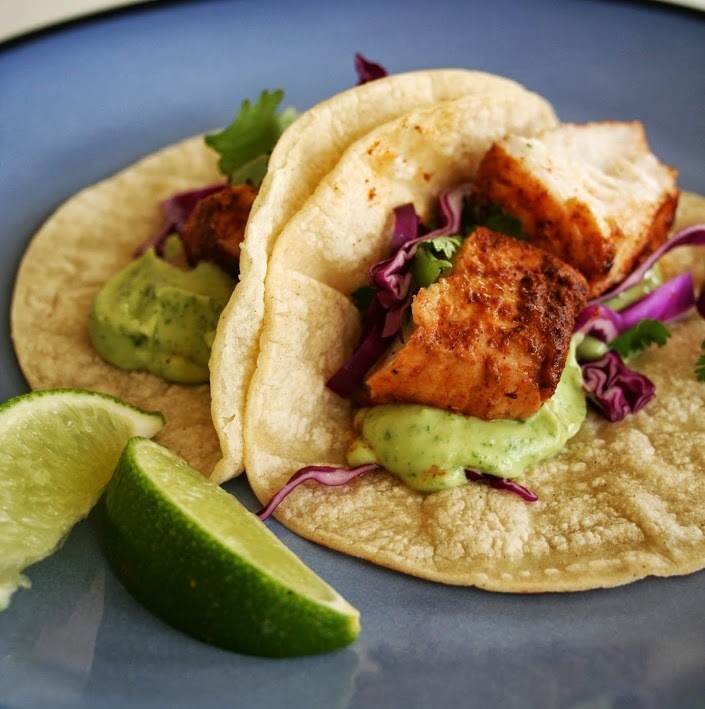 Divide the fish evenly between the tortillas, then serve immediately with bowls of toppings so that everyone can top off their tacos as they please. These are scrummy! No, I didn’t make that word up 😉 These are basically this recipe and instead of using the soft wrap bread, I used ciabatta rolls 🙂 Yes, it’s not a new one but it’s a good one! 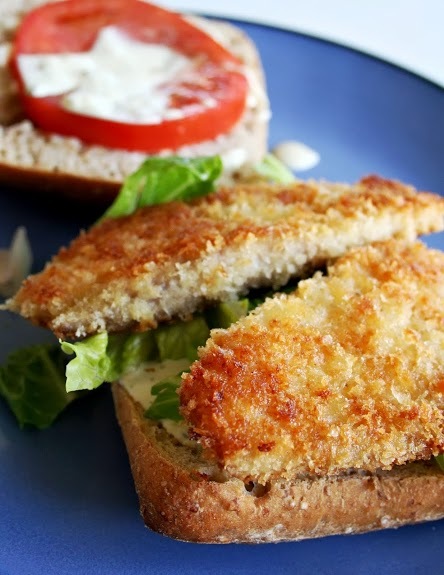 You can’t go wrong with crispy fish, creamy tartar sauce and more carbs 🙂 Thanks for reading, enjoy! 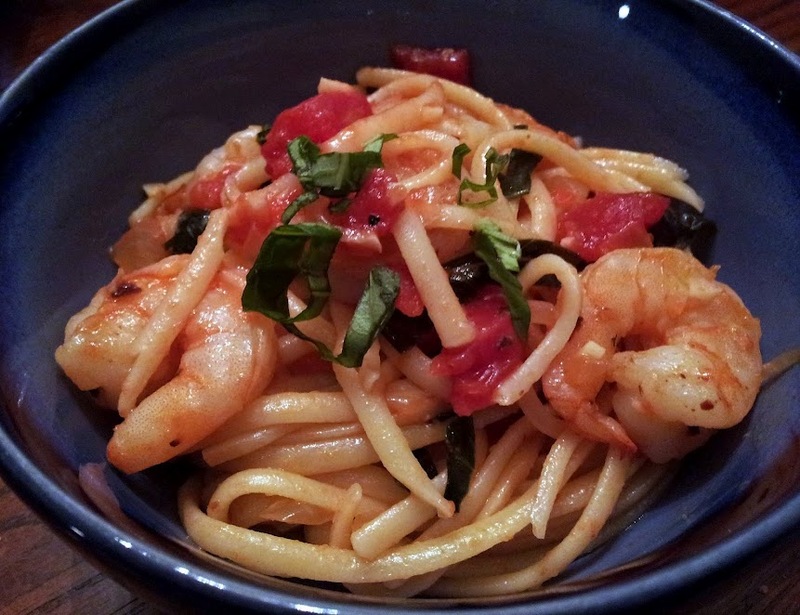 I posted this recipe over a year ago, but I wanted to share it with you all again cause it’s just that good! I made it exactly as the recipe calls for – 1 cup of heavy cream and 1/2 cup of vodka and everything 😉 No worries – I didn’t have two drunk minors stumbling around after they ate this. Thanks for reading, enjoy! Cook the penne pasta until tender-firm, also known as al dente. Peel, devein and rinse (under cool water) 1 pound of extra large shrimp. Heat about 1 tbsp. butter and olive oil in a skillet. Add the shrimp and cook for a couple of minutes until just opaque. Do not overcook them. Remove from heat and let cool for a few minutes. Now, put the cooked shrimp on the cutting board and pull off the tails. Chop the shrimp into bite –sized pieces and set aside. In a large skillet heat 2 tablespoons of butter and 2 tablespoons olive oil. Add the garlic and onion and sauté, stirring occasionally. After the garlic and onions have cooked a bit add your vodka or white wine. Let the vodka or wine evaporate for a few minutes, stirring occasionally. If you would rather not use alcohol, you can use low-sodium chicken broth instead (about ½ cup). Now add an 8-ounce can of plain tomato sauce. Stir well until combined. Then add 1 cup of heavy cream. Continue stirring. Turn heat down to low and let simmer. 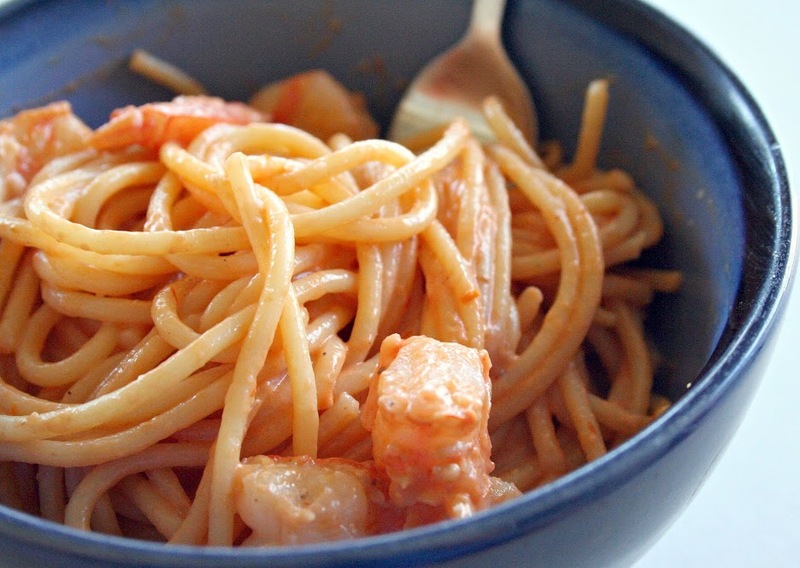 Now add your chopped shrimp back into the tomato cream sauce. Give it a stir and add salt and pepper to taste. Finally add your cooked penne pasta and give it a good stir. 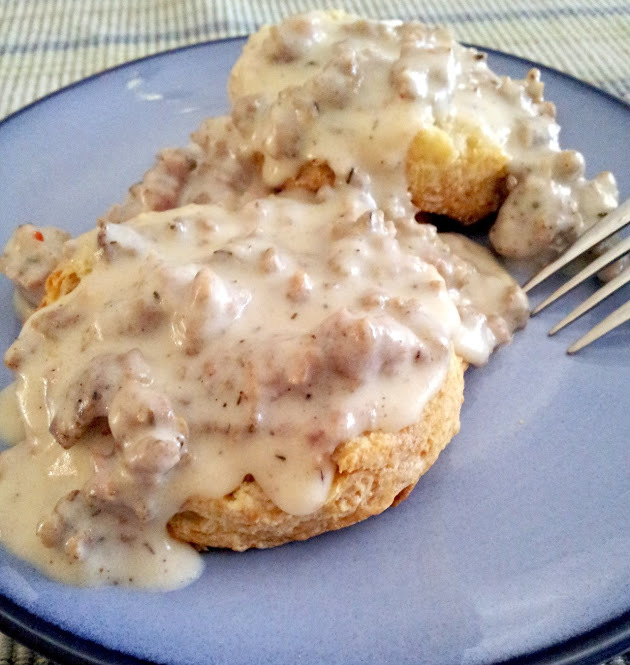 These were really good and I will definitely use this recipe again. Even my picky daughter ate her serving up! Thanks for reading, enjoy! Chop the cilantro, and thinly slice the green and purple cabbage. Chop the onion and set the veggies and cilantro aside. In a small bowl add the adobo sauce from the can of chipotle peppers, sour cream, lime juice, and salt. Mix and set aside. Put the shrimp in a medium size bowl and add the chili powder, garlic powder, pepper, cumin, and salt. Mix together so that the shrimp is coated with the spices. In a medium size skillet add the olive oil. Then add the shrimp. Turn the shrimp as they cook until each side is lightly browned (about 6 minutes). 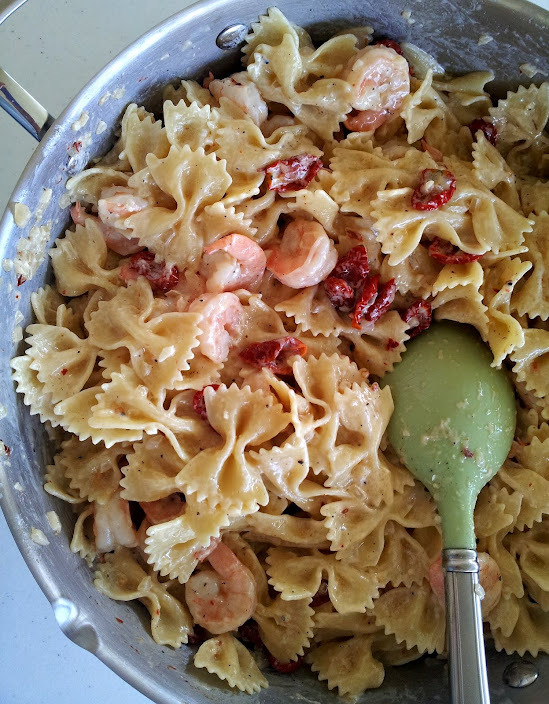 Reserve the olive oil in the pan, and remove the shrimp on to a cutting board or plate. 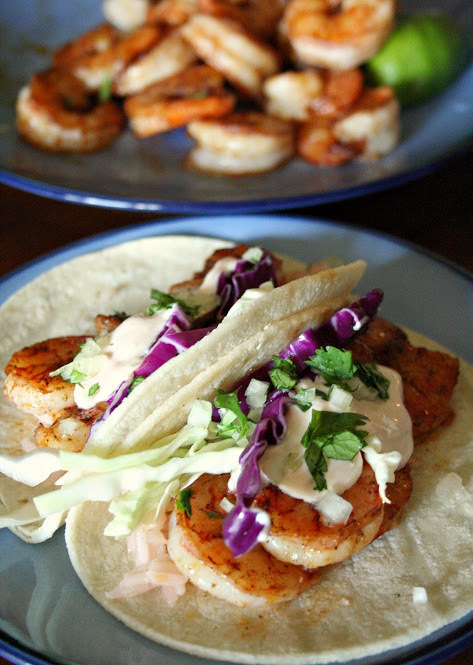 Warm the corn tortillas in the microwave for about 10 to 12 seconds.Then top with the shrimp, onion, cilantro, and the green and purple cabbage. Drizzle the adobo sauce on top. Serve while the tortilla is still warm, and with a quarter piece of lime. 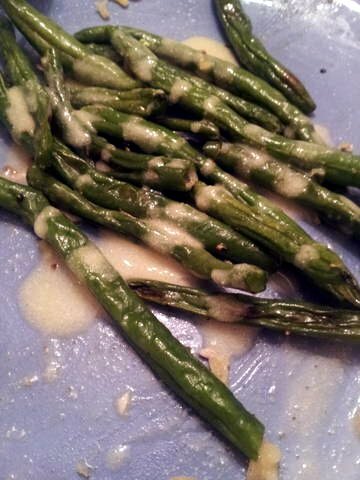 This was really good and the lemon butter sauce was an amazing addition to this simple but elegant meal. I will use this sauce recipe again and again because it would compliment vegetables, fish and chicken wonderfully! 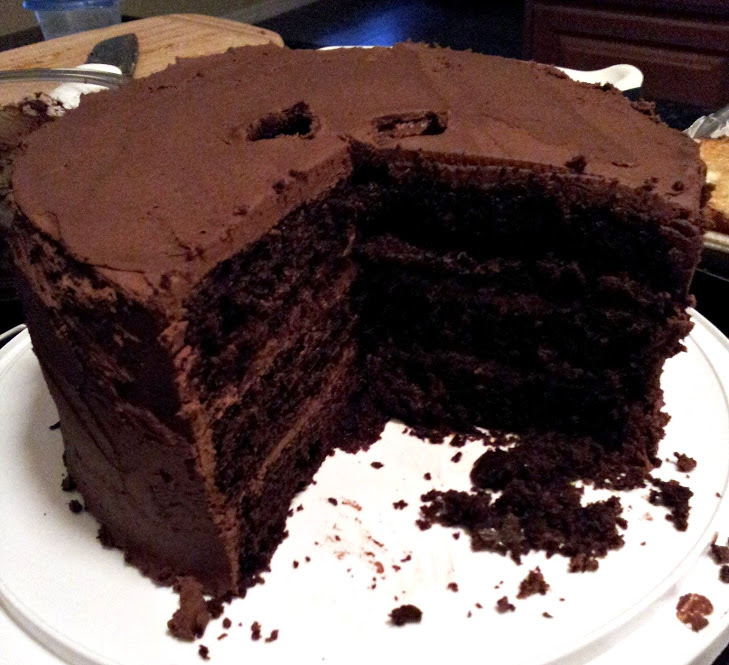 My husband gave this an “8”, which I agreed with – but the best compliment was from my picky six-year-old daughter…she ate it all without complaining! 😉 Thanks for reading, enjoy! Dry the fish fillets well. Dust with flour on one side. Melt 1 tablespoon of the butter and brush the floured side of the fish. Season with salt and pepper. In a large skillet, heat the oil over medium-high heat. Place the fish on the skillet floured-side down and cook for 5 minutes per side, or until it is just cooked through. Remove the fish to a serving plate. Quick Post: This meal was a hit! 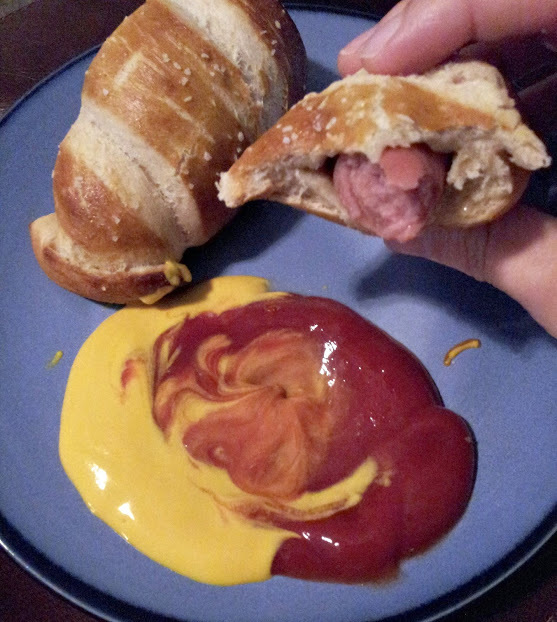 My picky daughter went as far as to call this “brilliant” (a word I have never heard her use – but I appreciated it), and asked if I could make this again for Thanksgiving! She’s six, so I let that slide 😉 I will post the flat bread recipe I used for this soon – that one is a keeper, too! Thanks for reading, enjoy! 1. Prepare the sauce by combining all ingredients in a small bowl. Refrigerate. 2. In small shallow dish (pie plate), lightly beat egg with 1 tablespoon water. In another dish, pour in panko and in another dish, the cornstarch. 3. Season the tilapia with the blackening seasoning and salt, then lightly coat the fish with cornstarch – gently pat the fish to remove excess. 4. 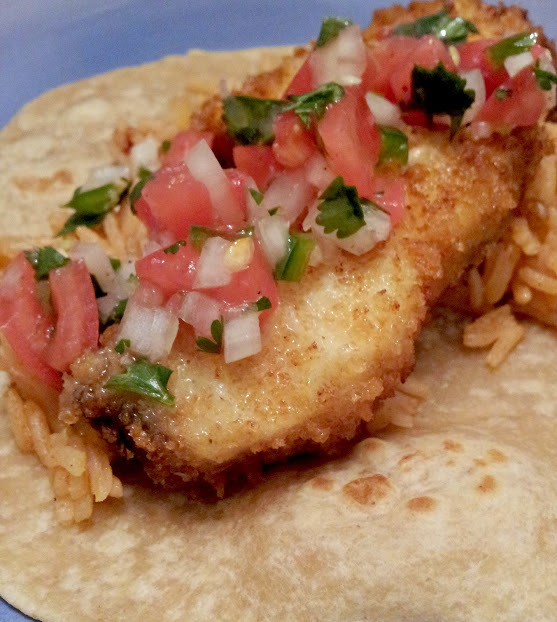 Dip the tilapia into the egg mixture, and then place the fish in the panko, making sure the piece is evenly coated. Set aside onto a clean plate and continue with the rest of the fish pieces. 5. In a heavy skillet, add enough oil to come up the sides 1/8-1/4” inch. Heat the oil over medium high heat until it shimmers. 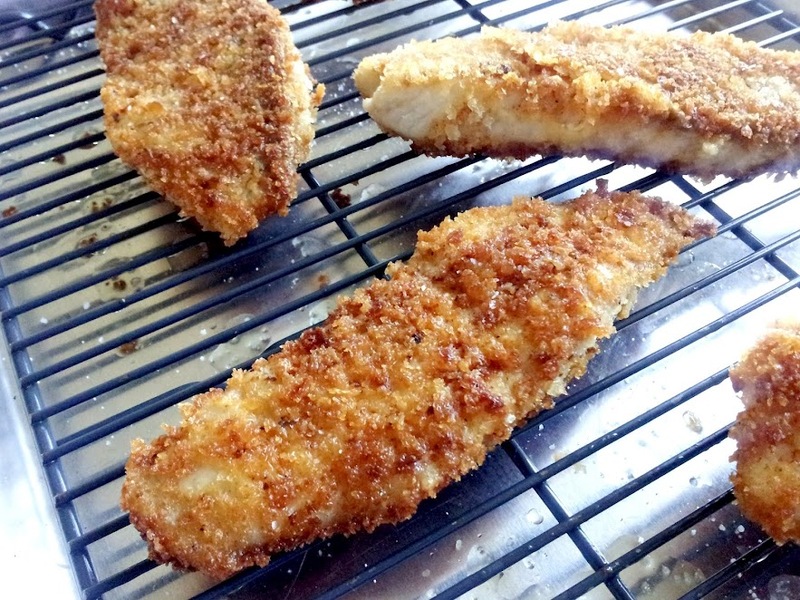 Test the oil by dropping a little panko in the pan. The oil is hot enough bubbles form around the panko. 10. Without overcrowding the pan, fry the fillet until golden, flipping once. Depending on the thickness of the fillets, these will cook in just a few minutes. 11. 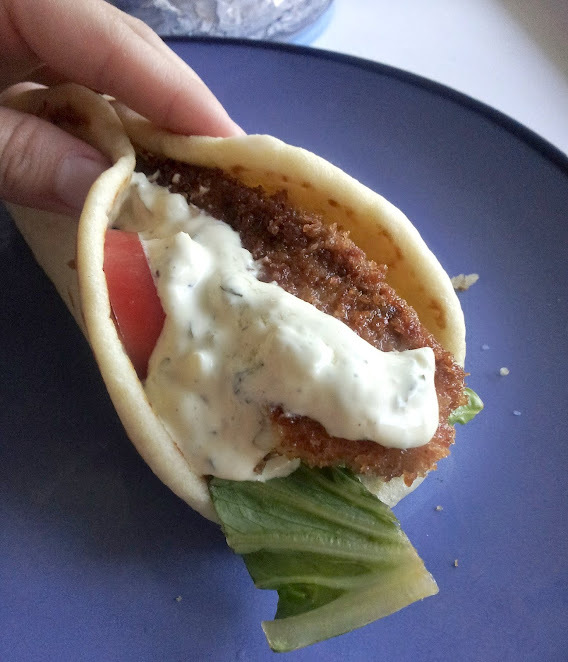 To serve, spread tartar on a flatbread, arrange tilapia, and other toppings of your choice. 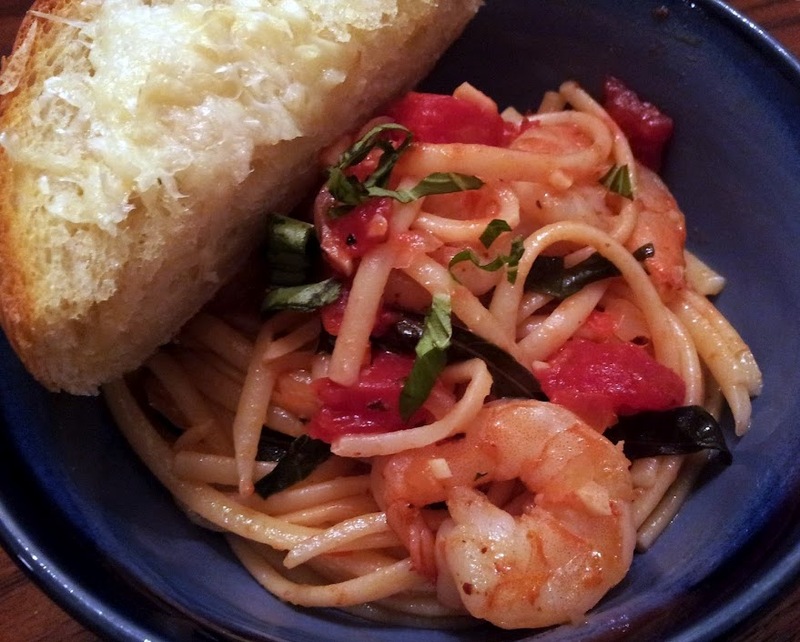 Quick Post: If you like spice, love shrimp and adore carbs and cheese – this is the dinner for you! 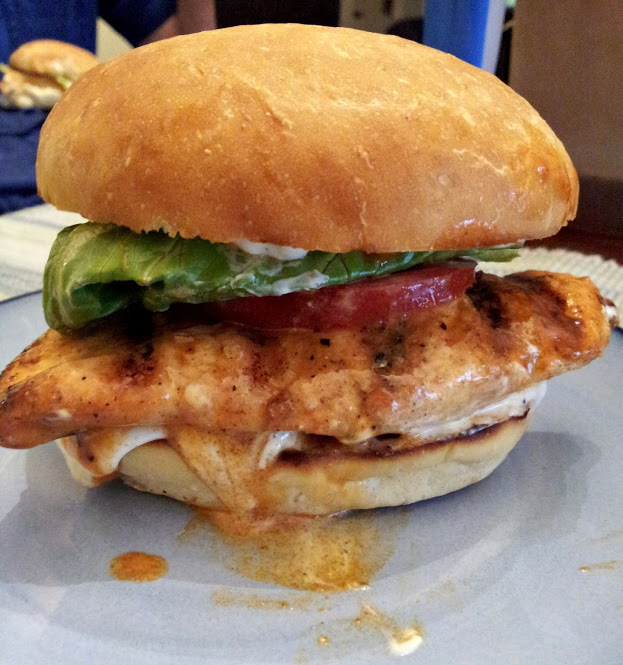 We thoroughly enjoyed this meal, and I will make this again. I served it with some quick garlic bread (I forgot to roast the garlic for this), but it hit all the right buttons 😉 I used a loaf of this, lots of chopped garlic, butter and four different Italian cheeses. Thanks for reading, enjoy! Heat the 3 tablespoons oil in a heavy large skillet over medium-high heat, add the red chili flakes to the oil. Add the shrimp and saute for about a minute, add the salt and toss, and continue cooking until just cooked through, about 1 to 2 minutes. Transfer the shrimp to a large plate; set aside. Add the onion to the same skillet, adding 1 to 2 teaspoons of olive oil to the pan, if necessary, and saute until translucent, about 5 minutes. Add the tomatoes with their juices, wine, garlic, and oregano. Simmer until the sauce thickens slightly, about 10 minutes. Return the shrimp and any accumulated juices to the tomato mixture; toss to coat, and cook for about a minute so the flavors meld together. Stir in the parsley and basil. Season with more salt, to taste, and serve.